We went out to Knob Creek yesterday to try out the new Savage Model 110 in .243 Winchester and we were very pleased. The scope, while “bore sighted at the factory” must have been zeroed to a much greater distance than what we were shooting, 50 and 100 yards. After we figured that out, the rifle settled down and began to shoot nicely. We fired a total of 40 rounds, perhaps a bit much, but we were swabbing the barrel every three shots. The .243 Winchester cartridge is a nice shooting load. It’s a .308 case necked-down to 6mm. It is the largest varmint cartridge and the smallest deer load, and consequently it is not punishing to shoot like a .30-06 or 7mm Magnum. The .243 strikes a good balance–pleasant for target shooting but powerful enough to train my kids to hunt. This is not to say that it has no recoil, because it does. After about 20 rounds, Alex, 14, said he was finished for the day because his shoulder was getting tender. We went out to the range with a box of Remington 80g soft points, and when we had fired those, we bought a box of Federal 100g HydraShoks. The kick from the 100g bullets was noticeably stronger than the 80g. This is the first new long-range precision rifle I’ve owned. All of my other rifles have been hand-me-downs or used. Since this was a new and never before fired rifle, I wanted to make sure that I was initiating it properly. I had read a bit about the esoteric subject of barrel break-in and wanted to do it right if a break-in was in fact required. In the good old days, back when I was a kid, I never heard anything about breaking in barrels on hunting rifles. People just bought a new rifle and went out and shot it. Nevertheless, this art of barrel break-in has emerged recently so I researched it the best I could given my eagerness to get out to the range and shoot it. I did purchase a bore guide and a one-piece cleaning rod for the purpose of avoiding nicks in the chamber and gunk in the action. In talking to people and scanning the web on the question of barrel break-in, I found opinion that ranged from almost mystical devotion about rituals of barrel break-in on one hand to a total rejection and disbelief on the other. The theory goes like this: on a new barrel, minute burrs and such catch copper as the bullet blasts down the barrel and removing the copper between each shot has the effect of polishing the barrel by preventing copper build-up. This is said to make the rifle a more consistent shooter and easier to clean up. To a certain extent this makes sense because it is logical that some of this would happen, and it’s not that different from fire lapping. On the other hand, isn’t that what I’m paying the rifle manufacturer to do, to prepare a firearm with adequate finishes inside and out which will enable it to perform accurately? Oh, well. I decided to split the difference. We swabbed out the barrel with Hoppes between each shot for the first five shots, then between each three for twenty. Seemed to work pretty well, and it was very easy to get the barrel “squeaky clean” at the end of the day. The Simmons scope is a variable power 3-9×40 hunting scope with a simple duplex reticle (cross hairs). It does not have distance estimation marks, mil-dots, or some of the other niceties of the premium scopes, but then it doesn’t cost more than your car either. The optics are very bright and clear and the adjustment controls are straight forward and easy to use, giving 1/4″@100 yard click stops for elevation and windage. If I were going to be shooting much further than 200 yards, I would want more scope than this, but for hunting deer in the 100-200 yard range it is fine and quite adequate. For target shooting and plinking, well, it already sees much better than I do, and if the target is out past 200 yards it better be the size of a car. This rifle and scope is one of the best values in a quality thunder stick that I’ve seen in quite some time. 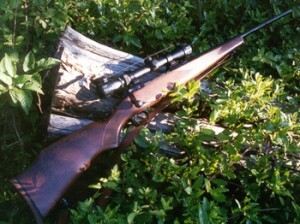 In terms of accuracy, the Savage rifles hold their own and often exceed their Remington and Winchester counterparts which cost twice as much.